Between June 2015 and the end of 2016, FrieslandCampina introduced beverage cartons in the Netherlands that are even more environmentally friendly. Renewable (bio-based) PE is purchased for the coating and cap of the cartons, based on biomass instead of fossil feedstock that was used previously (naphtha from petroleum). 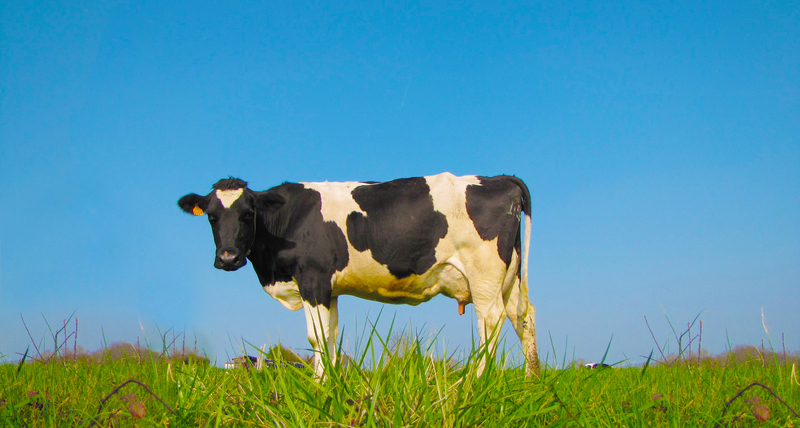 As a result, FrieslandCampina is encouraging the sustainable production of renewable plastic. The transition to renewable beverage cartons is aimed at cartons for all fresh dairy products (available in the refrigerated section). With a turnover of over €11 billion, FrieslandCampina ranks in the top 10 of largest dairy companies in the world. The company employs around 22,000 people and is active in 32 countries. The more than 19,000 member dairy farmers in the cooperative are the owners of Royal FrieslandCampina. Sustainable development is integrated into FrieslandCampina’s mission statement “Nourishing by Nature”: better nutrition for the world, a good income for our farmers, now and for generations to come. Climate-neutral growth is a central component in the Route2020 strategy that is based on these goals. Sustainability initiatives are being undertaken throughout the chain aimed at reducing environmental pressures, increasing circularity and reducing the use of scarce raw materials and additives. Since September 2015, the yoghurt and dessert cartons have special folding lines, making them easier to empty and combating food waste (remove). The way in which renewable PE is used in our beverage cartons is an example of collaboration within the production chain. FrieslandCampina invests in an equivalent of the total biomass volume required for the production of the second generation of renewable PE for the coating and cap of all its beverage cartons for fresh dairy products. Through the investment made by FrieslandCampina, SABIC purchases the equivalent of biomass required for the production of the second generation of renewable PE for the coating and cap of all its beverage cartons for fresh dairy products of FrieslandCampina. 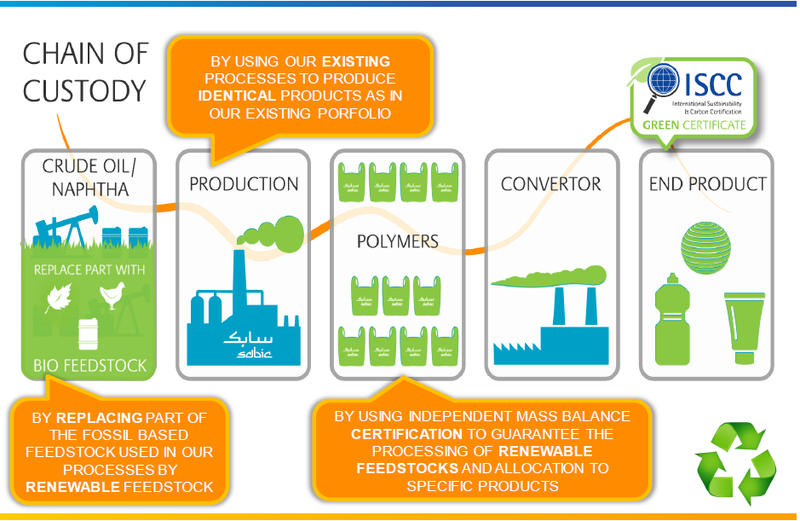 SABIC uses this volume of biomass to replace part of the current fossil-based raw materials in the production process for PE and PP. Based on an ISCC PLUS-certified Mass Balance chain of custody, an equivalent amount of renewable PE and PP is produced in addition to the fossil-based PE and PP. 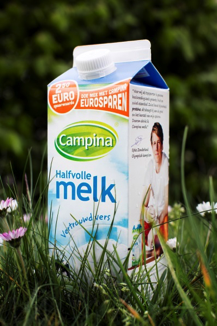 Elopak incorporates the certified renewable PE in the beverage cartons of FrieslandCampina. The chosen Mass Balance construction has two important advantages. It guarantees that the specifications of the packaging remain unchanged and as a result both the workability and the recyclability of the packaging. This way of working also helps the scalability, which in turn speeds up the transition towards renewable packaging. This is why FrieslandCampina has also relinquished exclusivity and called on all market parties to participate in the transition from fossil-based raw materials to renewable plastics in beverage cartons. 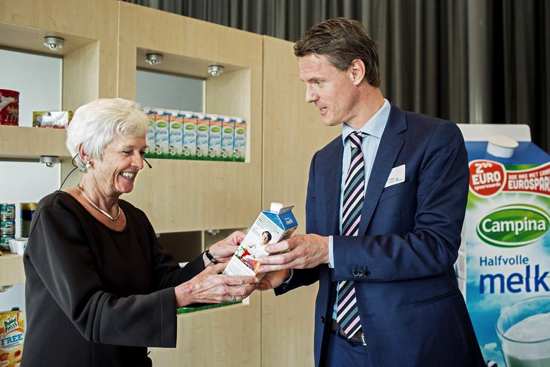 Berndt Kodden, Managing Director of FrieslandCampina Branded NL hands over the symbolic first milk carton to Jacqueline Cramer, former Minister of Housing, Spatial Planning and the Environment.